As a popular sweepstakes app, we’ve powered thousands of promotions. The question we ask ourselves most is – why do some perform better than others? Here are 7 common traits we see in our most successful sweepstakes promotions. Most successful promotions begin with setting a primary goal. Do you want to grow your email list? Increase your Facebook likes? Bump up your Pinterest or Instagram follows? Are you trying to increase customer engagement via surveys or polls? There are endless ways to setup sweepstakes. Selecting a primary goal keeps you focused and provides a key metric for measuring success and ROI. Creativity is what separates the major leaguers from the minor leaguers. You can get creative in a variety of ways, like picking a theme for your sweepstakes. We’ve seen themes built around destinations, national holidays, back-to-school, and major movies. One book promotion used the setting of the book as their theme. Customize your entry form and landing page based on your brand, theme or product. Are you targeting surfers? Get their pulse rate up by showing a beautiful pipeline wave. Make your entry form and landing page stand out and don’t miss an important branding opportunity. Have a promotion plan in place for your sweepstakes. Some marketers post to their social media channels and it’s one and done. Rockstar marketers have a plan in place and look to leverage every promotional asset they have. They promote to their internal email lists and post multiple times to their social channels. They find partners with similar audiences to cross promote with. 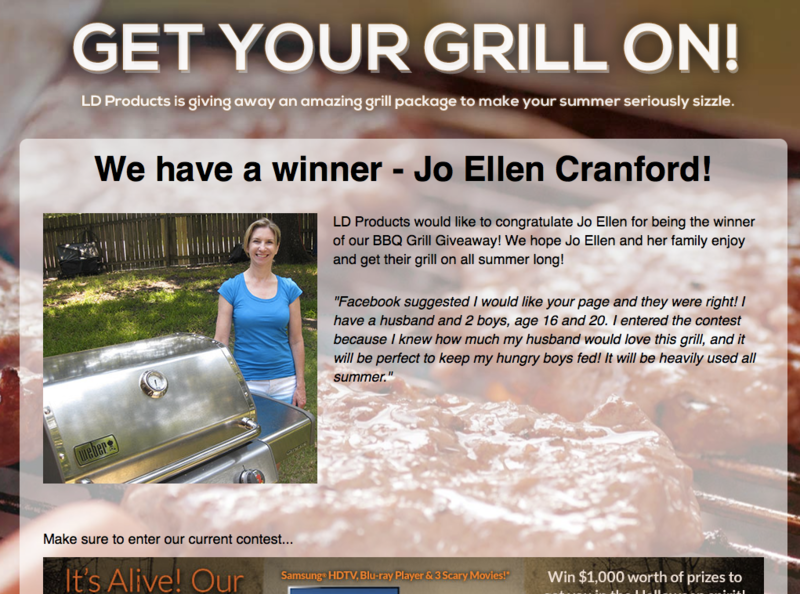 They add a promotion layer like hello bar to their website to promote their sweepstakes . One insight is to make a final marketing push at the end of a sweepstakes as the expiration date motivates people to take action. 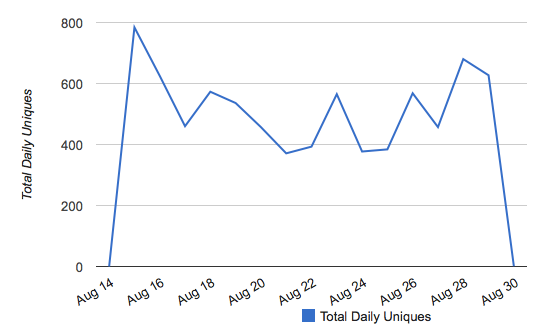 This is a chart of unique entrants by day for a recent sweepstakes. You can see the effect of a late marketing push just before the campaign expired. This is an area where I’ve seen marketers run into trouble. If you’re running an acquisition-focused sweepstakes to grow your email list or social fan base, be careful where you promote your campaign. If you list your promotion in sweepstakes directories you’ll get lots of entries but most of these people are not interested in your brand or service. I’ve spoken with several marketers who’ve told me sweepstakes are a waste of time as an acquisition tool. They mention how they ran a sweepstakes to grow their email list or Facebook likes and how all the entries produced zero results. I always ask them if their sweepstakes ended up in sweepstakes directories and they nearly always say “yes”. If the goal of your promotion is acquisition the key is targeting the right audience. As marketers we fight tooth and nail to rise above the noise and grab people’s attention. You’ve finally got your audience to engage with your promotion, so take the opportunity once they’ve entered to say “thank you”, offer them a coupon, or direct them to interesting content on your site. I shake my head when I see a sweepstakes that leaves fans with nowhere to go after they’ve entered, a prime opportunity for further engagement has been missed. One popular feature in PromoSimple is our custom message area that you can display right in your entry form once people have entered. 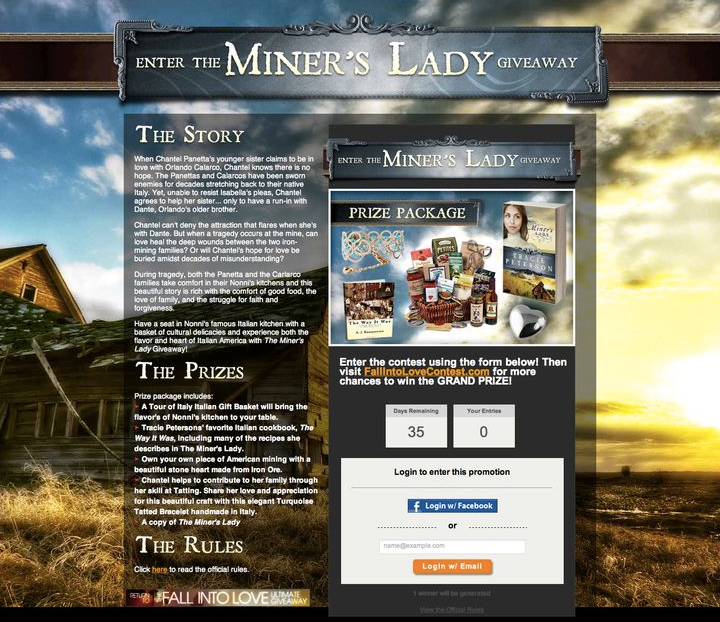 Build virility into your sweepstakes. Use a refer-a-friend entry method where entrants can receive extra entries by referring their friends. We’ve seen this increase entries by up to 50% in some sweepstakes. 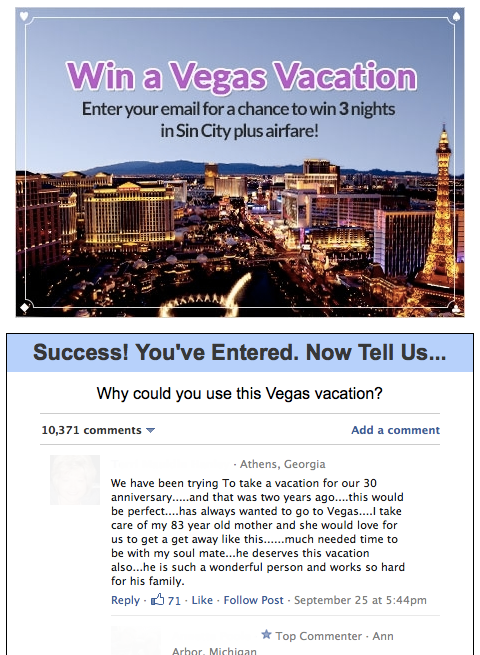 AirfareWatchdog recently ran a Las Vegas sweepstakes with PromoSimple and asked entrants why they could use a trip to Vegas. They used a Facebook comment box and generated over 12,000 comments that showed up on their friends’ feeds. 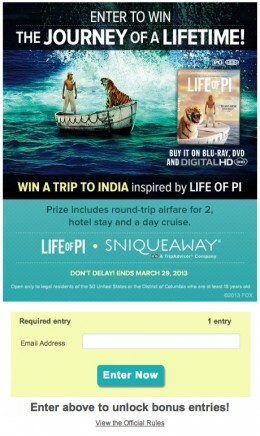 One of the most neglected areas of sweepstakes promotion is follow-up. Where top marketers really shine is in the follow-up. They email people right after they’ve entered via auto-responders, and again when a winner is announced. This is another great opportunity to say “thank you”, offer a coupon, or direct them to special content on your site. It’s also nice to post a congratulations message to your entry form or landing page.